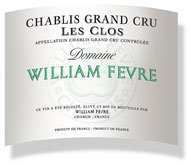 William Fevre is one of the leading producers of Chablis and continues on a path of continual improvement that began back in the mid 1990s. Significant quality parcels of vineyard in Les Clos, Les Preuses, and elsewhere ensure that the wines are terrior driven with excellent typicity. Minimal intervention during vinification and little new oak ensure the wines are superbly fresh and delineated.